Have you ever met anybody who doesn’t like sweet potatoes? It seems to be a rarity, as these sweet little souls seem to please just about everyone – from toddlers trying solids for the first time to the average meal-prepping adult. Sweet potatoes are not only a great vegetable to add to your weekly diet, but they are certainly not difficult to incorporate. From the preparation to the rich nutrients, we advise adding some sweet potatoes to your cart every time! It seems odd to think about such a vegetable that humans consume so frequently as being one of the oldest of all time – yep – Christopher Columbus is the one credited in history for swooping up sweet potatoes from America and bringing them to Europe in 1942. The man knew a good commodity when he saw it! We ought to take a moment of silence to honor Christopher because he helped adapt the most frequently grown root crop in any country today. Sweet potatoes produce more pounds per acre than any other cultivated plant – even regular potatoes, considered Irish potatoes. Here’s a humdinger for you – sweet potatoes are not a potato. Right down to the growing and harvesting of the crops, the processes of sweet potatoes and your average potato are completely different! 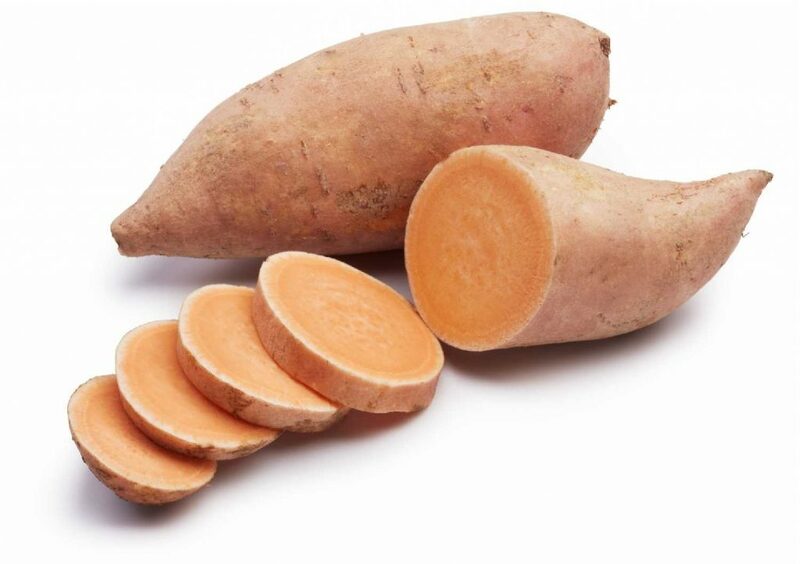 Additionally, the confusion between the difference in sweet potatoes and yams is very common, and it is true that they are completely different commodities. Here’s where the confusion gets tricky – when the orange-fleshed sweet potatoes became popular in the United States, the produce industry decided to clearly distinguish them from the white-fleshed kind. In the United States, yams are considered sweet potatoes with orange flesh. The sweet potato is considered to be much more nutritious than the Irish potato due to the sugar and fats. Although that may not sound more nutritious, these beta-carotene-rich vegetables are a great source to get your Vitamin A. They are packed with fiber and when they are raw, and are typically around 86 calories. They certainly will fill up your carb intake with an average of 27 grams of carbs. 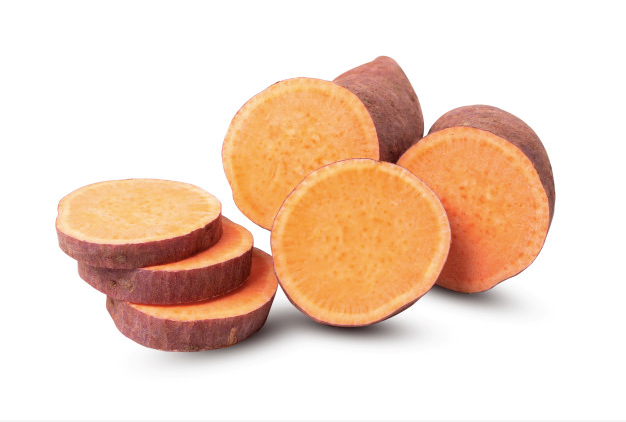 This alone is what makes sweet potatoes such a hit in the fitness and health industry – they are a great way to get the good carbs that you need that break down quickly. It is important to note that there is a high glycemic index in the consumption of sweet potatoes due to the sugar, and it is something to be wary of if you have diabetes. However, research says it is possible sweet potatoes with white-fleshed skin can help regulate blood sugar if consumed in fair amounts, regularly. There may not be much protein at all in sweet potatoes, but there certainly is no shortage of vitamins and minerals – from Vitamin A as we previously spoke of to Vitamin C, Vitamin B6, B5, E, potassium, and manganese. There are endless ways to cook these sweet jewels – they can be baked, fried, steamed, mashed, or roasted. You really can utilize sweet potatoes in just about any way in your cooking. The skin of the sweet potato is great to use as well. Be sure and brush off the surface with water and a vegetable brush. Then brush fresh olive oil and sprinkle salt and pepper over the top and then pop them in the oven to bake! This creates an appeal for eating the skin where so many of the nutrients are, and the skin comes out crispy and tasty. You can even cut the baked sweet potato in half and spoon out the insides for mashed sweet potatoes and then utilize the hollow skin with a bit of melted butter inside and eat the sweet potato skins! The sweet sensation along with the crispy and savory taste of the salted skin makes for a great snack. We won’t “yammer” on any longer about sweet potatoes, you get the gist!